When a cloud based Microsoft exchange service is installed on your Windows XP computer you may find that Outlook may not save the password for your user's mailbox. Depending on the version of Microsoft Windows XP you are running, you can implement the following work-arounds. If you are using the professional version of Windows XP and the computer is already connected to an existing domain environment, you will need to add an additional server entry into the saved passwords section of your windows user profile by following these instructions. 1. From the Windows XP Control Panel, choose the User Accounts option. 2. 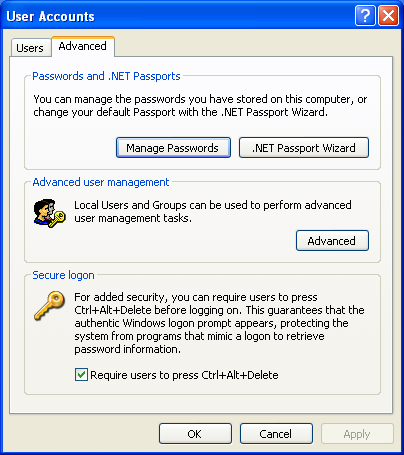 In the User Accounts dialog window click on the Advanced Tab, and then choose Manage Passwords. 3. In the list of Stored User Names and Passwords, you will probably find ONLY ONE ENTRY for the server getafix.exchange.mailsolutions.com.au. Click the Add button, and enter a second entry for the client proxy server exchange.mailsolutions.com.au using your Microsoft Exchange mailbox username and password in the format below. 4. In the event you had no entries for your Microsoft Exchange servers in the list. Add an entry to the list for the server getafix.exchange.mailsolutions.com.au. 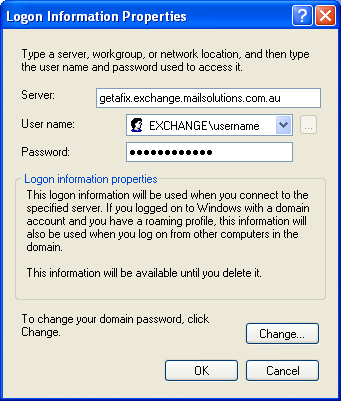 Use your same username and password for Microsoft Exchange the same as above. 5. 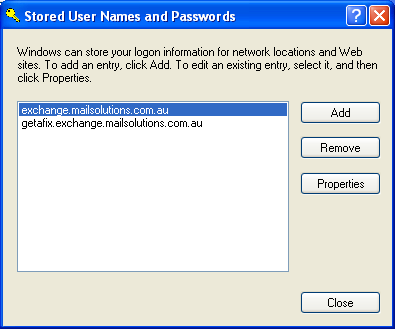 Once complete, you should have two saved password entries for your Microsoft Exchange server as shown. Click OK, and OK to save your changes. Microsoft Outlook should now no longer prompt for your password. If you are using the Home version of Windows XP, then by design this version does NOT automatically support saving of Microsoft exchange passwords. However you can try a third party work-around utility, which will automatically create a command driven script attached to an Outlook Icon on your desktop to automatically open Microsoft Outlook without entering your password each time. WARNING: Webvault offers no warranty or guarantee regarding the safety of compatibility of this third party software. USE AT YOUR OWN RISK!